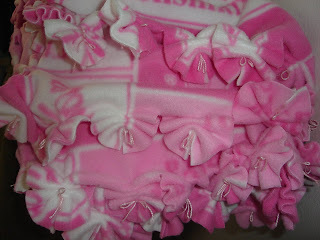 Here is what the blanket looks like. The first picture is how it looks spread out the second is how it looks up close of the bows.This is a bow tie fleece blanket. All the bows are hand sewn on. 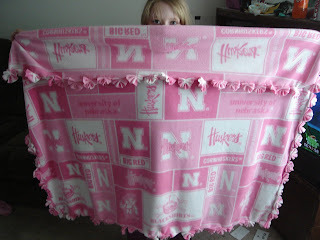 I chose Nebraska Husker fabric because she is a fan of huskers and because i thought it was neat to see a pink Husker fabric instead of red. The Hancocks Fabric store is where i got the fabric. I went to the one on 84th ? It's by Mangelsons. I prefer the smaller one in council bluffs, because they usually have a nicer selection of fabric. I'm recovering from being sick. I got sick from running in cold air and having an asthma attack. What an idiot i can be sometimes. So i didn't chase any wonderful sales this weekend. I just bought a few things on sale and came home and got back into my bed. I finally forced myself to wash towels so my daughter could take her shower last night. Before i got sick i was working on a blanket to take to my neighbor that is in the nursing home. I wanted to give her something nice to still maybe perk her up while she is in there instead of flowers which will die. I'll post that in a second. $5.00 off Build a Bear Printable Coupon! Print your Build A Bear Coupon by clicking the title. As i expected nothing more than allergies. Too bad the nurses would not listen to me and just let me give her, her medicine for it. Dr. said just allergies- strep test came back negative. Now my daughter's perfect attendance is not so perfect anymore. And poor thing was so heart broken. Here are some good deals for the Omaha Area. There use to be a $1 off one there as well. I received a phone call today from school that my daughter is sick. So, i will have to make an un expected shopping trip tonight. All her hard work for perfect attendance is gone. I am so sad over it but not as sad as her. All kids who make perfect attendance get a FREE bike and helmet. She has just worked so hard for it and now all gone. She's cried today and begged me not to make her come home but i made them take her temp 1 more time once i got there to make sure. It's such a big deal because she was sick 32 days last year and 40 something the year before. She has severe allergies & asthma. I'll let you know how things go tonight. I will be paying out of pocket for the Dr. visit and medicine. Yes, i am late on this weeks but oh well. Better late than never, lol. I'm also going to start including the price of what it roughly cost me to make. Smartsource has a $4 coupon they put out for any Pace product ( it will automatically start printing when you click the link). With such a high value coupon I’m pretty sure salsa will end up being FREE! But it gets better! The printing limit is more than 2x. 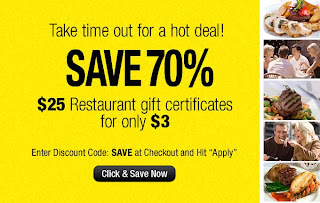 Click the title to go get your smoking hot coupon. Nothing was on sale this week we needed from Walgreens & I had $13 in Register Rewards to use because they were expiring, so i just got some things we use instead. There are a couple items that i can not remember to add what they were but The total price i paid is correct. I only went to 1 store this week, lol imagine that. No Bakers. Sorry for posting so late. I would have posted sooner but my pc has crashed 2x since Sunday. Oh my what a hectic weekend. My computer crashed when i bought this new keyboard yesterday and i have been having a hard time getting it up and ready. Thank goodness for my wonderful husband who knows how to fix computers, lol. I did lose everything i had on it though. Which makes me very sad because i had a lot of pictures, all my coupon class info and handouts. 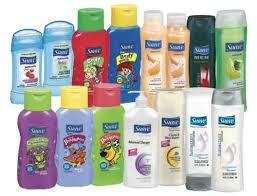 All my printable coupons that were in pdf form. Everything, it makes me sick and sad. Good news is at least my pc was fixable aand not completely broke. I also received some sad news yesterday. My all time favorite cashier is leaving Walmart. I tell you it took me a very long time to find someone i like, and now he is leaving. I enjoy him as my cashier because he is extreamly nice, funny and does all my coupons right and my price matching right. So i will miss you Don :0( But good news is he is not leaving right away. I sure hope he found my blog when i gave him my site yesterday, so we can stay in touch. He had told me he had a different interest for his career. He will be moving on to become a nurse. I know he will be a great nurse because he just has awesome people skills. I'll post my shopping trips later. My coupon box has been receiving a lot of attention lately. When i was at Walgreens, a lady commented on it and of course i told her about my site :0) I also tell people about HCW. I went and bought a few things needed. I was going mainly just for meat, the other things i found i just bought because they were cheap. And i don't even have a cat, lol. I buy that stuff when i see it dirt cheap and give to my SIL for her little kitty. Too bad i can't never find dog food that cheap, lol and yes i have a dog :0) I had to get a raincheck for the $1 light bulbs. So if your store doesn't have them, make them give you a raincheck. Now if they can get some in before May, lol. That is when my Q's expire for them. Here was the deal for those light bulbs GE light bulb $1 -$1 coupon=Free. Oh, today has been a much better day for me. Whew, no more fruit roll up scarfs, lol not as much fighting. I have been helping my neighbor. She fell yesterday and hurt her foot. Now she will have surgery on it Tuesday. So i had been helping her. I gave her my extra cordless phone. We weren't using it right now anyhow. I am washing 2 loads of laundry for her today and will wash probably 1 more before the weekend is over for her. I went and got her some groceries last night. I will probably make her a nice meal or 2 for this upcoming week. Some people ask why am i doing this ? I just ask myself this why would someone ask me that ? I am doing it because i am a good neighbor and a friend. Isn't that what neighbors and friends do for each other ? We help each other out. I hope all is well with you today! Today is a hectic day so far. Kids keep fighting over everything and then my daughter decided she would wear a YoGo's fruit roll up as a scarf. Not sure if you have had them but they are really sticky and really soft. I have no idea why an 8 yr old would do this. She said she just wanted to wear it like a scarf. Oh my, i see how today will go, lol. How is your day going ?? Receipts must be receievd by 5/13. Allow 6-8 weeks for delivery of gift card. It does not say, but I get the impression as though the $50 spent must be in one transaction. If you want a chance to win that $50 Kroger Gift Card, make sure you sign up at Nickels-n-Dimes. You can do so by clicking the above link. This giveaway is open until March 17th at 11:59 pm. Sorry no pic today. My camera is broke. I will need to now find a new camera on the cheap. So if you know of a deal let me know. Went tonight to mainly get the meat. All out again for the most part. I will go again soon. I see readers coming here all the time. I know your reading, why not take time out of the day just to say hi ! If you stop by and say hi, i will enter you in a drawing to win a FREE bottle of Suave. Value up to $3. 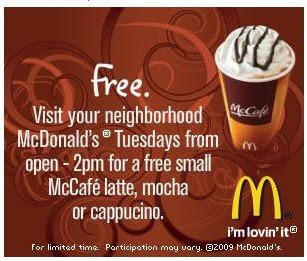 This is a coupon you will receive by me in the mail. The drawing will end on 3/16/09 at 9am. You will have 24 hrs to get back to me, if you don't i will have to move on to the next person in line. 1).You can enter a couple of different ways. Post a message about my giveaway or my site on your blog, myspace or facebook. Then come back and leave me a message and link to where you posted. 2). Just stop by and say hi on my blog. Free Iams Kitten Food If you have a kitten, here is a great deal! Walmart has 2lb bags of Iams Kitten food regularly priced at $4.87 - $5/1 Iams Kitten Food in the 3/1 P&G insert. =FREE Kitten food. If you don’t have a kitten, then consider donating to a local animal shelter in your area! Final Price =FREE + $0.22 overage! Here's what's instore for me today. Cleaning, Laundry, taking children to the Omaha Children's Museum. Working on grocery deals for this weekend. Bakers is having a Mega Sale so i have to take advantage of that. Always love that store. So friendly, and even if a problem does occur they do take care of it. Mentioning of the Omaha Children's Museum: Did you know you can get a membership for $5 throughj the Welcome Fund, if you can not afford the membership and meet the income guidelines ? I found that out and had to share with you. Is your child obsessed with trains ? If so you can print some out and make some. We have made 2 trains so far, you know you can't just make one because the other needs a friend. Click on the tittle to make them. HyVee & Omaha Zoo have teamed up in rasing money for the zoo. Right now you can buy a membership for $78 at HyVee. Here's the deal. You buy a SAFARI hershey's bar for $10. When you buy the candy bar they will give you a coupon for a Buy 1 get 1 free coupon for the Imax and a Buy 1 get 1 free coupon for the Sky lift. You will also receive $5 off your membership. Total $38.50 You visit 2x and you have your membership $ back. It is so worth it. Nothing to brag about today. It was not a very good trip. Just got some things we needed and that was about it. I skipped Bakers this week. I may try to hit them up either Tuesday or i'll wait until the weekend. Items Bought: (All items were price matched) Except for the newspaper. Which reminds me. How do you like the new price of the newspaper ? $2.00 ??? They owe me $2.19 now for both items rang wrong. Went to Walgreens today, awesome deals that i needed this week. I would have shopped more today but i needed to go to Walmart and get my grocery shopping done. So here is what i bought at Walgreens. I went to Target hoping to get the $2.49lb meat, all sold out or either pulled off the shelf. This was at the Target on 120th & K ? I believe. So i went to Walgreens last night. Not my normal Wags but it was once along the way. I am really surprised at to how many people working for Walgreens do not even know there own coupon policy. Anyways, here are the items i bought. -$1.50 Blink Internet Printed Coupon. Now i have $16 in Register Rewards to use starting Sunday. HyVee Ice Cream 1.75 qt $1.88. Purchase a Haeir Freezer $199.00 get $200 in coupons for free. Sorry about not posting yesterday. I have been feeling kinda sluggish this week. I received word that Pamida is going to double coupons. March 7th-13th they will double up to $1 in coupons. They will not accept Internet Printed coupons though. I find there store to be over priced but i have been able to get a couple deals there before. Once they had Betty Crocker Pumpkin Muffins and Cranberry Orange Muffins for $1 a box i had $.55 off coupons so i got 4 boxes of muffins for FREE. So if i am out that way again during this time i may venture in there. Otherwise it's not worth a drive for me. Hello all, i hope all is well with you. Yesterday i made some choc. chip muffins, everyone ate them. I had only 1. I didn't like them. Never use that recipe again, lol. We ended up having Chicken & Bacon BBQ Tacos last night instead. They turned out yummy. I will fix again. I just hate spending all that time cooking the bacon. Have you heard ? 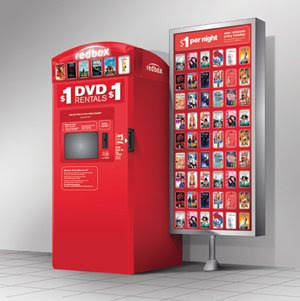 REDBOX is now offering FREE Movie Rentals on Wed. too! I hope your day is going well today. Mine is pretty well. I've been cleaning today not as much as i should though, lol. It's an improvement though. And i have things planned for dinner. I forgot the bread so i have to go get that though. I didn't have to get the bread, lol we had left over taco shells, yeah. I wanted to share something w/ you all today. I received an email for Free Build A Bear Animal Coupon. Value up to $12 or $12 off my animal purchase. Coupon is good for 3/6-3/8 only. Can only be printed 1x it says. So keep an eye out in your email box. Coupon looks like this one below but a few things different. Mom Saves Money is giving away a $10 Barnes & Noble e-Gift Card! Check out her site to learn more about her very generous offer. You can click on the tittle to take you to her site or you can click her button on the bottom of this page. This weeks menu is nothing fancy by all means. 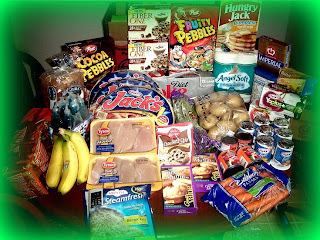 Were trying to spend less this month and eat more cooked meals from home. Last week we had fast food a few times. I want to empty out our freezer and pantry some. What is on your menu this week ? I'd love to hear what your fixing and what your saving. Often times i am asked what do i hold my coupons in ? This is my coupon box. Nothing fancy and certainly not special to others. Special enough for me though since it serves my purpose and it only cost me $1.99 I have had my box now for over 1 yr and it is still doing well. What do you hold your coupons in ? Please excuse the mess around my table. I have girl scout cookies and the boxes all over my spare dining room. Coupon from there website. You can print 2x.